Are you struggling with the P0420 code and want to clean your catalytic converter, but you realize that it’s a lot of work to remove the catalytic converter and you want to do it without removing it? Then, this article is for you. We will discuss how to remove the catalytic converter without removing in on your car to get the best results, and you may save a lot of money by doing it. If you want to learn more about the P0420 code before cleaning it, you can check out our article about it here: P0420 code. There are some things that you have to consider before trying to clean your catalytic converter. In a lot of cases, the parts inside the catalytic converter will get loose, and if this is the case, you can’t repair your catalytic converter without removing and replacing it. If your catalytic converter is so clogged that the engine will not run, you have to remove the catalytic converter and either use special tools or replacing the whole catalytic converter. You can try with take a hammer and hit your catalytic converter carefully to listen if there seem to be any loose parts inside it. If you can hear loose parts, I do recommend to remove and inspect the catalytic converter, because the loose parts could come even looser and clog your exhaust pipe totally, which may make your vehicle to stop while driving. Remember that your catalytic converter may be cleaned inside and the parts inside it may have blown out from the exhaust pipe. This can be tough to see without removing it and if you suspect it, remove the catalytic converter and check it. Your catalytic converter may have to get clogged caused by internal oil consumption, caused by oil entering the cylinders and getting combusted and burned inside the hot catalytic converter. If this is the case, you should always repair the internal oil leak before using this cure, as it may just work for a short time until the catalytic converter is clogged again. Common symptoms of an internal oil leak are clogged crankcase ventilation, broken valve seals or piston rings. Always check the crankcase ventilation first. 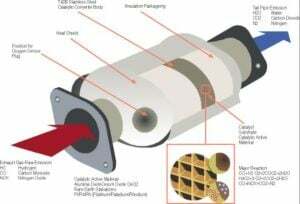 If you checked and listened carefully on your catalytic converter to make sure there are no loose parts inside it and the catalytic converter is not too clogged, you can try this product to get it cleaned while driving.
. You tap it into your fuel tank, and it does not matter if you have a petrol, diesel or hybrid car. This will help not just to clean the catalytic converter; it will also clean your O2 sensors and the whole exhaust system. Remember that this product will not repair mechanical faults inside your catalytic converter if it’s cracked, broken or too clogged. This is a cleaner for the catalytic converter which may have run with some oil burn before. Tap this into the tank with the required amount from the manual you will get. Drive your car a couple of miles to see if your car runs better than before. You can also try to drive your car at high RPM’s over 3000 for a long distance to reach the catalytic really hot to burn out the clog inside it. Remember to check that there is no oil or other fluids on your catalytic converter that could ignite it. Also, check the coolant temperature of your car at all the time, to make sure it’s not overheating. The Oxicat did not work for me, what to do now? If you tried the Oxicat catalytic converter cleaner, but the problem still insists, there is not much more to do than removing the catalytic converter to inspect it and to make sure it looks okay. Remember that there can be other causes of the P0420 trouble code like faulty O2 sensors or exhaust leaks and the problem may not be in your catalytic converter. Removing the catalytic converter are often quite easy on most of the cars if you can get the rusty bolts loose. In some car’s the catalytic converters are fitted directly to the turbo, and in these cases, the removal of the catalytic converter may be more difficult. Let an automotive workshop do the job for you if you are not sure how to do it. If you still think that your catalytic converter is clogged and it looks okay while inspecting it, you can try to clean it in a bath with water and Lacquer Thinner. This does sometimes work, and it may save you some money. If you tried to clean it and diagnosed the catalytic converter correctly to make sure it’s the parts that are damaged, there are no other choices than replacing the whole catalytic converter. Catalytic converters are often expensive and this is because there are noble metals inside it which costs a lot to produce. Tap on your catalytic converter with a hammer to make sure there are no loose parts inside of it. The cleaner will not repair cracked, broken or too clogged catalytic converters. If the catalytic converter cleaner did not work for your vehicle, check all other related parts to make sure they’re not damaged and remove the catalytic converter to inspect it. You can clean your catalytic converter in a bath of Lacquer thinner if you are removing it. Catalytic converters are often expensive due to the noble metals inside it. Have you tried this method before to clean the catalytic converter? Let us know how it worked out for you by commenting down below! If you have any other car questions you are welcome to ask them at our homepage. My car runs great TSX 2011 162,00 miles a recall at 125,ooo miles pistons timing chain etc because of too much oil consumption. Now that code comes on then goes off?? Yes, there is most likely oil in your catalytic converter. The problem may disappear if you continue to drive it. Drive it hard to burn out the oil from the catalytic converter. In the worst case scenario, you may have to replace it. Of course, you can also try an additive to clean it while driving. You have a DPF filter in your diesel car. It’s important to not only drive for short distances while you have a DPF filter. Over time when you are driving the car warm, the DPF filter will clean itself with a regeneration. However, the engine has to be warm for this function to work properly. Hi I’ve changed my diesel car’s turbo charger recently but there is still no power it’s really weak and when I accelerate or drive uphill it makes a sound like whistling. Also, when I turned my heating on a smell coming from the engine bay get in the cabinate it’s like oil burning smell. I would check for any boost pipe leaks. The best way is to use an EVAP smoke machine, but you could also let a friend rev it up while you are listening or applying soap on the pipes and checking for bubbles! You can try to clean it with catalytic converter cleaner as mentioned in the article, I do not recommend using anything else because I have not tried it and I can’t recommend things that I’ve not used with success. It does not always help but it’s often cheap to try it. If the code still comes back several times after the wash, you have to replace the catalytic converter.